Discussion in 'MacBook Pro' started by macintoshi, Dec 19, 2011. I need to know, cause want to buy a new macbook pro, while i have a dualcore one still unibody late 2009, and still good one. If the changement between sandy and ivy is not so great for a mobile chip, that means haswell is the real upgrade over sandy, then would buy sandy now, cause haswell is somewere 2013. As time goes on things get better/faster/more efficient on a percentage level; companies that produce things like CPUs often plan to make something that can't currently be made but will intersect at an estimated time the technology will be available. If you keep waiting for the next fastest thing you will be waiting forever. If you have something now that you're happy..stick with that till you need a new one. You're better off spending a little bit for more RAM and an SSD upgrading your machine than spending a lot upgrading to a new machine. I would wait until 2020 at least. I waited for sandy bridge when buying my MBP (early 2011) because I wanted thunderbolt. Some people will buy Ivy based machines for USB3 (assuming that Apple won't/can't have an Ivy MBP minus the USB3) - and theoretically there should be some performance gains with longer battery life. I haven't read about hashwell, but if in general having the latest and greatest is most important to you, have you considered buying and selling every year? Well of course i can wait, till ivy bridge come out, cause i still have a working machine. I wouldn't wait till hashwell, cause it takes one year or more. But seeing the article down, i don't know if ivy bridge would bring some longer battery life. This is why i ask, to buy sandy or wait for ivy, am really kicked between them. If you really need one, especially if the Macbook Pro will make you money then go and buy now because your time and productivity is valuable. However if it is just an hobby and obsession then its wiser to wait. All we have on Haswell at the moment is Intel's promo talk. I'm sure IVB could provide 10 days of standby battery life if applied correctly. Heck, the 2010 MBA with C2D provides 30 days, though not connected battery life. If they don't shrink the battery Ivy Bridge will definitely bring better battery life. How much is the question with the big question mark. but considering the delays and the low clocks they start with it seems 22nm isn't doing nearly as good as they'd want to a little like TSMC 40nm. To me current SB is no reason to upgrade Ivy might be. I already got a decent enough 2010 MBP. I would like more GPU speed and a Quad but not with the 2011 MBP. It is not just how good Ivy "could" be for battery life it is also 28nm GPUs that show up a little before it and USB 3.0. USB 3.0 is something any new Notebook should have because I want a cheap and fast solution for external drives that is where my current MBP really falls short. FW800 is still too slow and way to expensive compared to eSATA or USB 3.0. Haswell is no bridge it is just Haswell. Don't get to excited about 10 days connected standby. That really doesn't get you much if anything at all on a notebook. This is useful for Tablets and hybrid things or maybe on a small Air. For a normal Notebook even with a 20 times decrease in overall power draw it just makes more sense to download updates when it is on and not waste power the whole time. You'd use smartphones for that stuff. This feature is probably aimed at powerful Windows 8 tablets or hybrid Ultrabooks. It doesn't say anything about a reduction in actual Standby power which would be odd anyway because the CPU is completely off and so is any Intel chip in standby. You cannot decrease a power draw of Zero. And it also doesn't say anything about a lower plattform power draw of an actual running system. How do you get from this articel to Ivy Bridge. The only thing that really matters for Ivy Bridge power draw is what the 22nm TriGate process delivers from all its promises. If that voltage/frequency curve really is like that it means a huge improvment on battery life under medium load. If you can run a core at 2Ghz with a V of .7 instead of a former .95 that usually means a lot of saved power on its own. Power draw = frequency * V² * C.
The squared on the V is the reason undervolting used to be such a great way of saving heat and power. It is just that the supposed meager 10% increase in frequency with still a 45W TDP seems like 22nm isn't doing very well. If this new TriGate transistors are so great why such a meager performance increase without moving the Quads into the 35W TDP class. From 45 to 32nm frequency increased by 25-35% which was quite a lot more. Those 10% we just got from the first Sandy Bridge to the newer Stepping and is common for new steppings but really bad for a new process node. Even if the TDP of 45W is a somewhat fuzzy thing and IB will probably not challange those limits the way SB does currently. I guess one should buy Ivy Bridge 2-3 steppings after release which means about 3 months later. I may be wrong though. There isn't much really useful information to go on and Intel may just be extra careful although such leaked CPU lineup "rumors" used to always prove true in the past. It is just that the supposed meager 10% increase in frequency with still a 45W TDP seems like 22nm isn't doing very well. 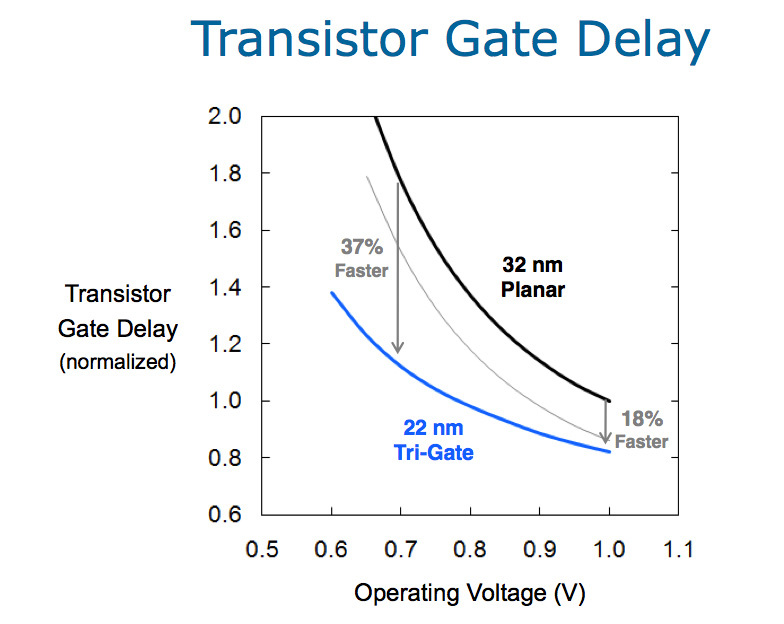 If this new TriGate transistors are so great why such a meager performance increase without moving the Quads into the 35W TDP class. From 45 to 32nm frequency increased by 25-35% which was quite a lot more. 45nm to 32nm was also Core to Nehalem transition because there was no 45nm mobile Nehalem (besides Clarksfield but then again, there was no 32nm mobile quad). The consumer chips saw a transition from 45nm Core to 32nm Nehalem/Westmere, so the boosts were more than just the die shrink. Also, I don't think there were any frequency boosts besides Turbo. 2009 15" MBP started from 2.53GHz C2D, whereas the 2010 model started from 2.4GHz i5. When taking Turbo into account, then the boosts were much greater. What you have to remember is that while the CPU core count remains the same, the GPU is seeing a boost. The EU count is up from 12 to 16, plus we will get a brand new architecture and higher Turbos. Those 10% we just got from the first Sandy Bridge to the newer Stepping and is common for new steppings but really bad for a new process node. Even if the TDP of 45W is a somewhat fuzzy thing and IB will probably not challange those limits the way SB does currently. There hasn't been a stepping update. Sandy Bridge CPUs are still using the same steppings as when they were released (D2 for quads, J1 for duals). Of course, there is always some work done on the chip to improve it but not enough to need a stepping update. Not to be picky here, though it is just simply Haswell. Not Hashwell or Hashwell Bridge or Hashwellbridge. One word pronounced: Has well. Hashwellbridge does roll off the tongue nicely though. If the changement between sandy and ivy is not so great for a mobile chip, that means hashwell is the real upgrade over sandy, then would buy sandy now, cause hashwell is somewere 2013. Ivy Bridge = Huge integrated GPU upgrade. Haswell = Battery life. If you want a MBP that can last 12 hours, than wait for Haswell. Honestly, at this point I don't care much about idle or web browsing battery life. Whether this is 7 hours or 12 hours doesn't buy you that much. The problem of the current MBP is that the user has to pay attention to what he does in order to have the battery last 7 hours, i.e. avoid flash videos, use gfxcardstatus and so on. What would be a big step up is to get the battery to last long also under medium load. I've heard that the TDP of the new IVs can be controlled by software. This would offer the possibility to introduce a powersafe mode that, when activated, limits the CPU to 10W, which would probably put the whole system below 20W. A current CPU limited to 25% of it's total capability is still faster than 3 year old C2Ds, and since flash playback similar stuff works without problems on those old systems, a SB or IV CPU throttled to 10W will do equally well. The other option of course is to use a 25W TDP CPU. However that would reduce the performance permanently, not just when using the "powersafe mode." The Westmere to Nehalem transition was before that and all on 45nm. Clarksfield was a 45nm mobile Quad and that is what I am talking about. What Apple uses (or not) in its products means nothing for this discussion of developement and what Intel used to spit out. which was quite a lot with little IPC increase but a huge increase in performance. One would expect at least 20% again. 2760QM 2.4-3.5Ghz vs a 3720QM 2.6-3.7Ghz same TDP same cache. I would say it is just an unlikely rumor but such leaked lineups have been true almost always for the last 5 years. I know what CPUs Apple used but that has absolutely no relevance. They skipped one generation and that the increase form a 2.5Ghz C2D to a Sandy Bridge was big is true but you cannot expect that again as this time they aren't running on old stuff. But you can compare a Clarsfield to a SandyBridge Quad. The Turbos are actually almost the same. Same amount of bins just higher base clock. A faster GPU is nice a 2 times as efficient GPU too but it doesn't help with general CPU speed. It would have to show in higher turbos or different TDP classes or something. How's that TB workin' out for you? I'm kind of disappointed myself. Was hoping the no odd, dual drive option in the 2011 models would come true. There is also anotherthing, i've never had ssd till now. Looking at the data, the speed make me to go for OCZ and buy a macbook with a normal hd and let the apple reseller put the OCZ ssd drive in. A difference of 32Gb storage, doesn't hurts that much. My question is, is samsung in term of durability or quality, lifespan better that OCZ? what come after hashwellbridge? Because I will wait until that one! But you can compare a Clarsfield to a SandyBridge Quad. No, you can't. Clarksfield to Sandy Bridge was die shrink and a new microarchitecture. Sandy Bridge to Ivy Bridge is only a die shrink. The architecture is what introduces things like Turbo Boost 2.0 etc, so it does matter. The reason the clocks are what they are is because once you start hitting ~4GHz, efficiency goes down, a lot. There will be a huge bump in power consumption while the performance gain will be negligible. That's why IVB looks so similar to SNB. Well but on the CPU side there was not that much difference. 10% at best and mostly due to the faster L3. The same as between the shrink to Penryn once which was also just a tick. The rest was just a GPU on DIE and all the other stuff like PCIe. If anything the gain in frequency should have been lower with all that other stuff on the same DIE that also produces heat. The CPU side of things, IMC and all the stuff that matter for CPU performance was mostly the same. There was a big difference in Architecture between Arrendale and Sandy Bridge but between Clarksfield and SB it was mostly a DIE shrink and a lot of non CPU related stuff like Northbridge integration. Still they pulled of a 37% increase in base frequency and ignoring any IPC increases from small changes that is a lot. With all the other stuff on DIE. Now with SB only 10% with nothing extra on DIE and not a new porcess node that is supposed to be like two steps like form 65 straight to 32. The barrier where the exponential power curve really takes off changes with each new process node. Looking at the TDP classes of the Desktop it seems to scale much higher clockwise with a more linear curve than Sandy Bridge. Hopefully power consumption will really take a nose dive but you cannot deny those numbers are a bit odd. Buy now and enjoy while you can, since the world is going to end in 2012. Still they pulled of a 37% increase in base frequency and ignoring any IPC increases from small changes that is a lot. It's not 37%. i7-740QM was the low-end Clarksfield (as it pretty much replaced 720QM in terms of price) and it was 1.73GHz. The slowest SNB quad was i7-2630QM, clocking in at 2GHz. That's 15.6% increase. Or we can look at this from the high-end as well. The fastest Clarksfield was i7-940XM, 2.13GHz. The fastest SNB at the time of release was i7-2920XM, 2.5GHz. A 17.4% difference this time. I don't think it does. If it changed on every process node, how come we have been stuck with just below 4GHz for four die shrinks now? There was a 3.73GHz Pentium 4 back in the days, but 7 years later, all we are able to achieve is 3.9GHz. As far as I know, the reason lies in the physics of silicon. Once you hit around 4GHz, the power consumption will go up exponentially. Otherwise Intel should easily be able to squeeze 5GHz Turbos at 22nm. Agreed my calculation was a bit unfair, but yours just takes it to the other extreme. The 2720/2760,720,740 are all in the $378 price bucket. The 2630 is just a cut down OEM CPU but not the real successor (the true 2630/2675 price isn't even known but it is most certainly lower in volume than 27X0). Also the 740QM never really made it into the market. 720QM held its space quite long and stayed being the real predecessor of 2630 while the 740 should be compared to the 2720. 2.2/1.73 = 27% or 2/1.6 = 25% is quite a bit more than 10% and with the TDP included of a GPU that takes almost 1/5 the die space and some other extra stuff. Even with the all the power gating, GPU turbo and what not that is a significant amount of watts to squeeze in. 37% was too much but it might be as much considering all the stuff on this die. Pentium was an entirely different thing that thing potentially supported enormous clock speeds. Compare the AMD CPU which stayed architectureally mostly the same. They had a quite steady increase in clock speed over all process nodes. 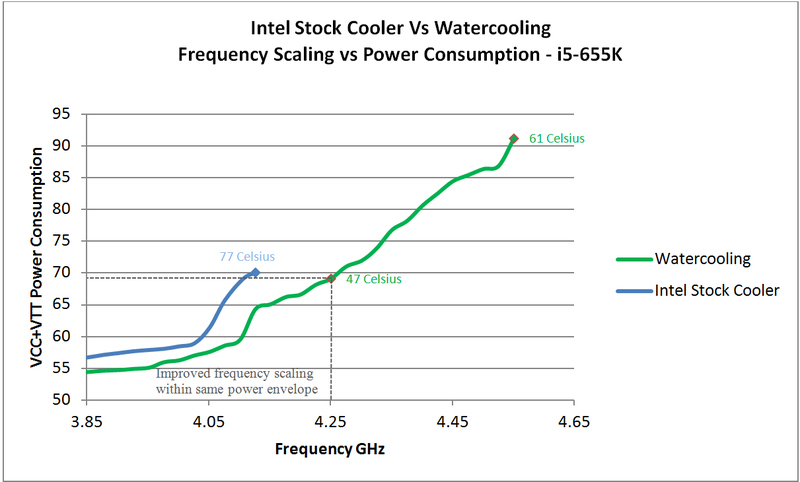 Check out the actual released CPUs of the last years and what overclocking freaks got from them. I think saying we have been stuck just below 4Ghz is a bit of a misinterpretation. Mainstream 65 was about 2.4 Ghz, 45 was around 3Ghz, 32 3.4. If you check out the CPU list on notebookcheck sorted by TDP or process your theory isn't well supported by data. Pentium doesn't count it is the oddball. Maximum Overclocks went from 4 to 5 then 7 Ghz and now we are at around 8 something Ghz. A magical 4 Ghz ceiling doesn't exist I think. Even if there was, I'd expect some TDP downgrades that maybe move the lower end quads to 35. Kill of the 55W TDP bucket and make the 45W the new highend. There is just no sign of the supposed 2 node jump till now. What became of all the promises of 22nm TriGate. You have to admit what is known till now is underwhelming. I expected more than a Penryn like shrink but that is what it is now. For the next gen I think the big improvement will be in the integrated graphics aka hd3000 versus hd4000. The integrated hd3000 run some fairly modern games ( some ) ok. The hd4000 should be somewhat better. The current machines are nice ... very very nice.